Training with Stephanie Berida at Palngun Wurnangat Association. Born Adriana Albertini in Sydney Australia, Adriana based her early fashion career forming knowledge and skills needed in construction and fitting by working in many areas of the fashion industry from men's wear, lingerie and bridal made to measure. This experience helped build a strong foundation needed in the coming years. A move to Darwin Northern Territory in 2001 saw a change in direction; a chance to use skills learnt and share them with others as a Lecturer in Fashion at Charles Darwin University for 11 years. 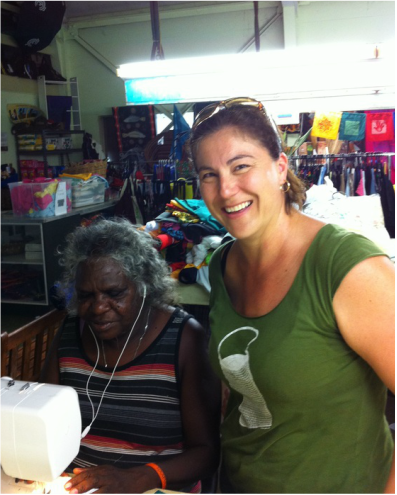 During this time Adriana was fortunate to have been given the opportunity to train in Indigenous communities in remote locations of the Northern Territory. With a busy Sydney fashion career spanning over 13 years Adriana had never contemplated starting her own label, yet ironically it was the beauty found from some of the remotest parts of Australia that drove the inspiration behind Albertini. Incorporating the art work from the Indigenous artist with modern one off couture gowns, each piece having its own identity with a story behind its creation. Fabrics are printed by Artist using their own art work, then given back to Adriana, who develops the design best incorporating the print. With no two designs alike any woman can confidently wear the gowns as a wearable piece of art and proudly share it's story.